Lesley J. Wood. Crisis and Control: The Militarization of Protest Policing. Toronto: Between the Lines, 2014. Pp. 205. Crisis and Control makes a significant contribution to our understanding of police responses to public protests. 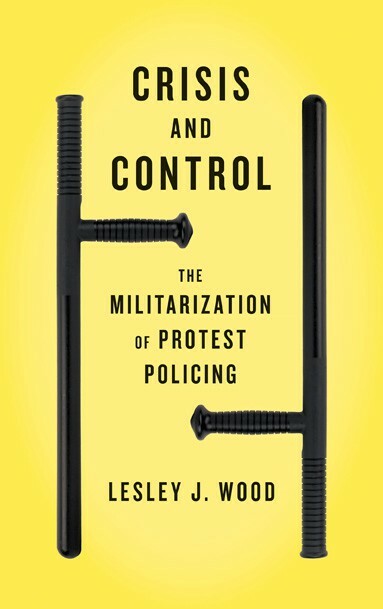 Wood challenges the reader to set aside personal politics and examine the broader roles and functions of police, and how these are often at odds with the goal of free speech manifested through peaceful protests. It is a fascinating book, particularly interesting for its analysis of the diffusion of ideas and tactics within and among police forces and the broader evolution of police use of less than lethal weapons. However, readers of Canadian Military History, presumably interested in military subjects, might find the book unsatisfying because it has very little to do with diffusion of ideas, tactics, or equipment from militaries to the police. The author, Lesley J. Wood, is a professor of sociology at York University. Her online teaching profile states that she is “interested in how ideas travel, how power operates, how institutions change, how conversations influence practices, how people resist and how conflict starts, transforms and ends.” She has a PhD in sociology from Columbia University and has extensive writing credentials regarding transnational social movements and networks. She has written a number of articles and her book Social Movements, 1768-2008, co-authored with the late Charles Tilley, is essential reading on the subject. Wood comfortably crosses international borders in her writing, providing apt comparisons and distinctions among her case studies. In addition to her academic credentials, Wood has been an active participant in the global justice and the anti-poverty movement. Among other protests, she was personally involved with activists at the 2010 G20 Summit. Wood’s book focuses on protest policing in North America over the past twenty years. Her work makes a valuable contribution to the literature, because there are few book-length treatments of the subject. Although there are volumes written about specific protest events and the police reactions (an excellent Canadian addition being Putting the State on Trial: The Policing of Protest during the G20 Summit), few take a broader approach and look for trends in different jurisdictions. Even fewer make use Canadian case studies. Wood, however, makes skillful use of four principal case studies: Toronto, Montréal, Washington DC, and New York City. Crisis and Control has a strong theoretical grounding. Wood provides ample discussion of the role of police and their relationship with the society they serve. Not everyone will agree with the interpretation. Wood describes police as tools of economic elites and political powerholders. Whatever your opinion of this characterisation, it is skillfully explained and provides the foundation for Wood’s analysis. Wood sets out how police forces learn and adapt in the modern environment of protest policing, assimilating lessons learned from major protest events, and the diffusion of “lessons learned” among police forces, spread by global forums for policing professionals, consultants, and manufacturers of such equipment. She skillfully moves from Canada to the United States and back again to illustrate her points, showing how information and ideas spread and are adapted. Wood’s description of the evolution of less than lethal weapons (particularly the chapter on pepper spray) and proactive responses to public protests are especially engaging. The author describes a process whereby police have increasingly focused on preventing protests from occurring in the first place and how this erodes the individual and collective freedom of speech. Police forces are increasingly held to measurable standards for performance; the incentives are given to preventing a protest from happening, not in allowing it to happen and then mitigating the risk. Police tactics, techniques and procedures consequently have evolved to support this goal and globalisation has increasingly homogenised their methods. Police respond to protests proactively and seek to disperse or contain crowds quickly, a trend which leads to infringements on freedom of speech. But the book is descriptive; not proscriptive. Wood describes the processes, the mechanisms by which police forces are moving down this road, but makes no claim as to how citizens or decisions makers can change it. Although the author concedes that police forces face challenging circumstances and restrained budgets, I do not believe that she gives due notice of the dangerous circumstances police officers can face. For instance, the author dedicates a chapter to the subject of “urine filled supersoakers,” the idea that protestors are routinely accused of using urine and faeces at protests despite a dearth of evidence that they use such tactics. These accusations, Wood argues, associate protestors with social taboos that discredit them and build barriers to understanding. One example, however, takes this premise a bit far. At a rally in Toronto in 2000, Sergeant Brian Smith was knocked off his feet and pulled into a crowd. Smith recalled, “I received numerous assaults. I was covered head to toe in paint, urine, faeces. My whole gun belt was destroyed. Parts inside my gun had to be replaced. I even had some… I had a smell of gasoline on my uniform too.” When pulled into the crowd, he said that he did not retaliate, “the only thing on my mind is to get free. I mean it’s … one of the worst things that can happen is for an officer to be dragged into a crowd because the crowd only has one intent and that’s to kill the officer.” The author claims that these statements were grounded in the officer’s fear and preconceived notions of the protestors that, “had set the stage for confrontation, fear, and even distortion of the truth.” But we are not given a different version of events to displace the officer’s statement given under oath in court. Wood merely implies that the officer was lying, consciously or otherwise. Furthermore, I do not think the officer’s fears were anything but reasonable. Being pulled into a crowd, isolated, disarmed, and having fluid of any kind poured on top of you sounds terrifying and highlighted the challenges faced by police officers in dealing with both peaceful and raucous crowds. A fair analysis of the subject, I believe, must duly acknowledge the risks faced by police officers and the public in preserving the peaceful right to protest. Another shortcoming of Wood’s analysis is the lack of discussion on the subject of militarisation, a curious absence given the prominence of the term in the book’s title. While this element is probably not critical to most readers, I presume that the readership of Canadian Military History would be particularly interested in this aspect of the book. Unfortunately, the author does not explain how the processes described constitute militarisation, or even what militarisation is. The author’s substantive discussion of the connection between the police and the military is limited. She uses some examples, such as United States Marine Corps General Anthony Zinni’s desire to develop less than lethal weapons for crowd confrontation operations in Somalia. She also mentions North American police forces making use of “lessons learned” by the British Army in Northern Ireland, a process that followed the British Army adopting tactics more reminiscent of community policing than conventional combat operations. But these examples are only mentioned in passing and, in my opinion, do not illustrate the militarisation of police. They are illustrations of militaries becoming more like police. Reading the title, one might expect that a book about the militarisation of police forces would examine the adoption of military tactics, culture and equipment by domestic police forces: diffusion from the military to the police. Plenty of possibilities spring to mind: perhaps a growing relationship between military and police forces through combined training, the use of the British Army for security at the 2012 London Summer Olympics, a cultural shift brought about by military veterans joining police forces, the adoption of semiautomatic carbines to increase police firepower, or the use of decommissioned armored vehicles from Iraq and Afghanistan. But these subjects are not explored. The police are “militarizing” in that they are adopting a “proactive versus reactive” approach towards increasingly “intelligence driven” operations. This characterisation may be adequate for most readers, but I suspect it will leave many readers of Canadian Military History slightly disappointed. Notwithstanding these criticisms, Crisis and Control is a fascinating book that makes a significant contribution to the subject of protest policing. It is a valuable read for anyone interested in protest policing in general, less than lethal weapons, or just how ideas about security are spread and adopted in a globalised society. Furthermore, there have been dramatic events in the area of protest policing since the publication of Crisis and Control, and the book holds up. The book predates such events as the civil unrest following the August 2014 shooting of Michael Brown by a police officer in Ferguson, Missouri; or the July 2016 shooting of five police officers at an otherwise peaceful protest in Dallas, Texas. But these events have not undermined Wood’s research, rendering it out of date. On the contrary, these events have withstood such developments and merely illustrate the quality of Woods’ methodology and the pressing nature of the subject matter. “Lesley Wood, Department of Sociology,” York University, http://people.laps.yorku.ca/people.nsf/researcherprofile?readform&shortname=ljwood, accessed 15 August 2016. Charles Tilley and Lesley J. Wood, Social Movements, 1768-2008, 3rd Edition (Boulder, Colorado: Paradigm Publishers, 2009). Margaret E. Beare, Nathalie Des Rosier, Abigail C. Deshman, eds., Putting the State on Trial: The Policing of Protest during the G20 Summit (Vancouver: University of British Columbia Press, 2015).